“It’s one of the last things in their area that belongs to them,” librarian Zillah O’Donnell said. 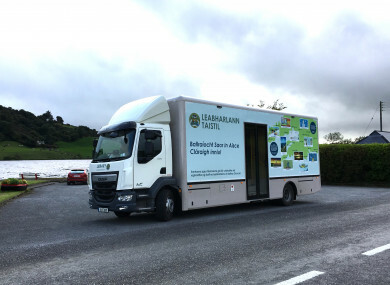 EVERY WEEKDAY, THE West Cork Mobile Library leaves its base at 9.30am and heads off on its regular route. It has a preplanned fortnightly roster – stopping off at schools, nursing homes, some people’s homes and even the side of the road for people who flag it down. It’s been a vital service for elderly people who can’t drive, and for those who live in isolated areas. Now, they’ve got a new set of wheels, which is a sign of confidence that the free service is staying put, Zillah O’Donnell, its librarian of 11 years tells TheJournal.ie. Last year this mobile library, which is one of six in the county, issued 37,000 items last year, as well as offering the odd tourist directions, and stopping in for a chat. One 92-year-old customer says when the service comes around to her nursing home, “If anyone asks me all I want is books” – for other people, that social interaction is important. “For everyone it’s something different,” O’Donnell says. The mobile library was first set up in the 1960s as a pilot to see how people in Cork took to it. After it was evident that it was doing really well, in 1962 it was properly established. “You’d drive to villages and different stops were made where people would flag you down at the side of the road – then more people would come along. And it still kind of happens like that,” O’Donnell says. The library currently has 7,630 items – that’s everything from tiny board books, picture books, novels, fiction books, to anime comics, DVDs, and audio books. Its 1,746 membership includes students, parents, the elderly across Clonakilty, to Mizen Head, and along the inland border to Ballingeary. It’s a job where O’Donnell, and her driver Sean Crowley, really get to know people. “We’d see kids grow up from junior infants, and would occasionally meet the siblings and ask how they are. There are two or three people who meet you [at the side of the road] who you’d get to know really well. If somebody’s sick or if there’s a death you’ll know… and your heart breaks. Obviously I’m kind of biased but I think it’s a wonderful service. She said she’s worked in other mobile libraries where the people who use the service are strangers to her, and she says “there’s no comparison” to her regular route. Added to their services for local book lovers, is the odd activity as a “little tourist office”. “We’d be trundling along these narrow country roads in the summer, and tourists would come around the corner, and then they see a massive truck come around the corner and freeze.” But they squeeze by, and tourists come in for a look. We’ve had people from England and US say they have mobile libraries where they’re from, but I’ve never had someone from Europe who’s had them. Instead of being threatened by the rise of technology and capabilities of the Internet, O’Donnell says she hasn’t noticed a drop-off since the smart-phone era took off. “If kids are introduced to books from an early age, they’ll always go back to it, it’s always accessible to them,” she says. For adults, some never had any interest in online, reading is a chance to get away from the Internet, from bad news and is a form of escapism. She says it’s a way of supporting the “far-flung communities” that don’t have the same resources as other parts of the country. Email “After 14 years, west Cork's beloved mobile library has been upgraded”. Feedback on “After 14 years, west Cork's beloved mobile library has been upgraded”.